Scott Reynolds Nelson is the Leslie and Naomi Legum Professor of History at the College of William and Mary. 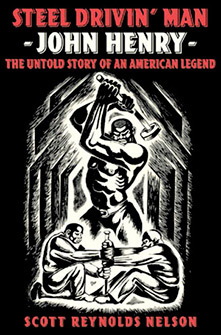 Steel Drivin' Man, which explores the real life and legend of railway hero John Henry, received the Merle Curti Prize for best hook in U.S. social and cultural history from the Organization of American Historians and the National Award for Arts Writing. The book received widespread coverage in publications as diverse as The New York Times, The Chicago Tribune and Entertainment Weekly. His research was featured on the cover of the Chronicle of Higher Education and has been given prominence on the History Channel. Nelson is the author of the 1999 work Iron Confederacies: Southern Railways, Klan Violence, and Reconstruction and is the co-author of the recently published A People At, War: Civilians and Soldiers In America's Civil War. He is currently working on a children's book, Ain't Nothing But a Man: My Quest to Find the Real John Henry, with co-author Marc Aronson. He received his bachelor's, master's and doctoral degrees in history from the University of North Carolina-Chapel Hill. He resides in Williamsburg, Virginia.